Primary blood supply to humeral head is the ascending (arcuate) branch of anterior humeral circumflex artery which runs in the bicipital groove. (Jaberg, JBJS 74A:508;1992) Less significant supplies include the posterior humeral circumflex artery and small vessels enteriing through the rotator cuff insertions. Deforming forces: Pectoralis major pulls the shaft medially, anteriorly and internally rotates. Supraspinatus abducts the head fragment in two part fractures. If greater tuberosity is fractured it is pulled superiorly and posteriorly by the suprspinatus and infraspinatus. Lesser tuberosity fractures are pulled medially. Head split or short articular fragment. Develop preoperative plan based on pre-operative radiographs using AO technique. Consider getting xrays of normal side to aid in pre-op planning. Consider augmenting with calcium phosphate cement (Synthes Norian SRS) (Kwon BK, JBJS 2002;84A:951). 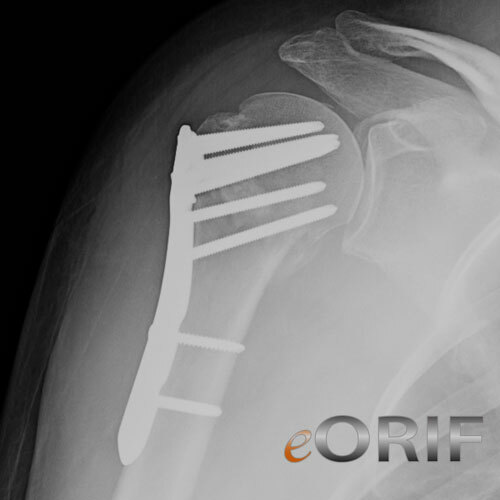 If there are concerns about the patients bone quality, or fracture pattern a hemiarthroplasty prosthesis should be available and the patient should be consented for both ORIF and hemiarthroplasty. 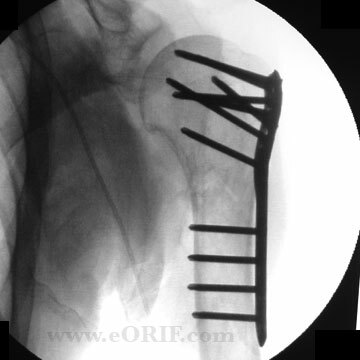 Arthex Humeral SuturePlate: plate has easily usable suture holes, but is not side specific. Must ensure calcar reduction and strongly consider calcar screw placement. Ensure the anterior humeral circumflex vessels are protected and preserved. Gently identify the humeral head fragment, being careful to avoid any neurovascular injury. Confirm that the head fragment is not split or impacted and the cartilage is intact. Reduce that fragments into anatomic position. The humeral head can usually be reduced by externally rotation the arm and gentle pushing and rotating the head into its anatomic position. The fragments are then anatomically reduced and temporarily fixed using k-wires or suture. Placing a non-absorbable #5 suture in a figure-8 fashion is often beneficial to maintain the reduction during plate placement and also serves additional fixation. Place a proximal humeral plate as selected in the preoperative plan using AO technique and as instructed in the manuctures technique guide. Pack allograft bone chips / demineralized bone graft as needed to improve healing. Primary / secondary screw perforation of the humeral head (SudKamp N, JBJS 2009;91A:1320). Risks of Anesthesia including heart attack, stroke and death. Risks of surgery include but are not limited to: Primary / secondary screw perforation of the humeral head, Subacromial impingement, Nerve injury palsy: Axillary, Infection, Loss of reduction, Need for further surgery, Hardware failure, Stiffness, Pain, Avascular necrosis of humeral head, Nonunion ,DVT/PE, Risks of Anesthesia including heart attack, stroke and death. 87%good or excellent results (Wijgman AJ, JBJS 2002;84A:1919).